Well that was just a fantastic episode. Or was it? Throughout its first season, The Grinder has played with TV form and convention. But each episode was couched in a hallmark of the genre it was parodying. 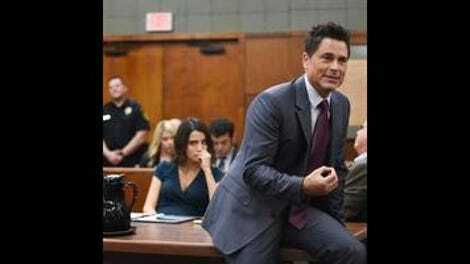 We got glimpses of the show within a show as a means of setting up the theme for each episode, and that largely worked, especially because The Grinder-within-The Grinder was actually pretty funny and the show so thoroughly committed to the gag. But “Full Circle” refused to couch itself in this fictional TV world, at least not as directly as it has done in the past. Sure, it played with the idea of grand finale, last minute evidence grab that is such a hallmark of these shows, but the episode never leaned on an example. Instead, it used tone and established character that had been cultivated throughout the show’s first year run to create great ending to what is one of the more ambitious seasons of TV I’ve ever seen from a freshman sitcom. “Full Circle” felt like one of the more traditional episodes in the run, and yet, it still capped off this experimental season exceptionally well. In the pilot, I asked for more Kumail Nanjiani and I’m so glad he came back. In a lot of ways, though, the Grinder we saw tonight is different than the one that premiered in September. That show was largely about Dean, with Stewart as a straight man in a lesser role. But as the show grew and evolved over its first season, it became more of an ensemble piece, with each actor bringing something different to The Grinder. That’s in part because of the serial natural that The Grinder took in the latter half of its second season. It allowed for characters like Debbie and Dean Sr. to become a part of the mix rather than simply act as side characters to prop up Dean and Stewart. While the fabulous ensemble work has been such a boon to the latter half of the season, The Grinder never really figured out how to use Natalie Morales other than a deadpan reaction. Other than act as a romantic partner to Timothy Olyphant, she never had anything of substance to do and rarely affected the plot at large. I was hoping she might get some time to shine as lead counsel on the Mandler case, but that instead went to Dean. 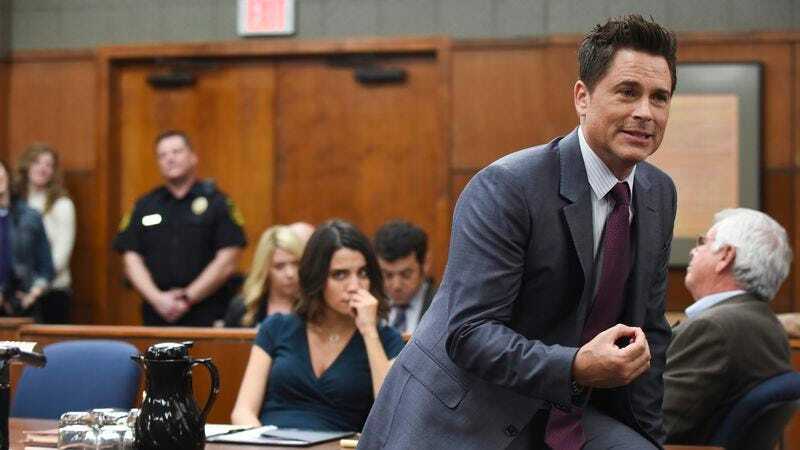 And Dean/Rob Lowe did wonders with the case, especially in how he worked off Nanjiani, who is becoming such a guest star MVP (not to mention Silicon Valley where he will always be my favorite. Sorry Martin Starr). The back and forths in the courtroom scenes where Valance tried to use what he had learned from watching Dean were some of the best the show has done (“It’s his last name. He turned it into a verb.” “Damn right I did.”). It’s funny to think that a legal show (even a parody of one) that has spent most of its time outside of the courtroom has some of its best scenes or the season in one. “Full Circle” is clearly the most apt title for this episode. While there wasn’t a direct correlation to the show-within-a-show, the episode played off pat endings that bring everything together nicely. There’s not even a cliffhanger — say Dean going back to Hollywood or deciding to go to law school. And it all worked. I spent so much of this episode smiling, in part because The Grinder had mostly pulled off exactly what it was trying to do. The high concept, and even the higher latter season ambitions, worked in a way that The Grinder was better than the sum of its parts in many ways. As Dean says at the end, “This works. This has legs.” Let’s hope we get a season two to see what they do next. “I like the hat. It’s at a very jaunty angle. Is that a personal choice or did it come that way.” “I do it myself.